Metropolitan Museum of Art opened its doors for the first time in 1870. It contains over 200 galleries and possesses over three million pieces of art. Idea: Consider reading From the Mixed-up Files of Mrs. Basil E. Frankweiler. Two siblings run away to the museum. They solve a mystery, and readers learn a great deal about the museum. Children can visit the museum website at: http://www.metmuseum.org/. Jefferson Memorial was dedicated in 1943 in Washington, DC. This date was picked in honor of Jefferson’s birthday. Construction was started in 1938 and finished in 1943. 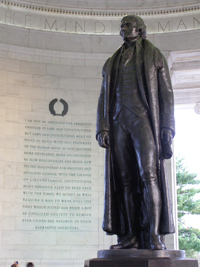 A bronze statue of Thomas Jefferson was planned, but World War II intervened and bronze was needed for the war. A plaster statue painted to look like bronze was on display until 1947 when a real bronze statue took its rightful place. Children can visit a website at: http://www.nps.gov/thje/. Samuel Becket (born Foxrock, County Dublin, Ireland, 1906; died Paris, France, December 22, 1989) wrote books and plays. During World War II he worked with a French resistance group. One of his most famous works is Waiting for Godot. Gunning Bedford, Jr. (born Philadelphia, Pennsylvania, 1747; died Wilmington, Delaware, March 30, 1812) represented Delaware at the Constitutional Convention. During the Revolutionary War he was for a short time an aide to General Washington. A staunch abolitionist, he served as a federal judge for 23 years. Alfred Butts (born Poughkeepsie, New York, 1899; died Rhinebeck, New York, April 4, 1993) invented the game Scrabble. He invented the game when he was out of a job during the Depression. After he sold the game to a company, he received three cents for each game sold. Erik Christian Haugaard (born Fredricksberg, Denmark, 1923; died June 4, 2009) fled Denmark in 1940 when the Nazis invaded. He began writing children’s books in 1963. He received the 1968 Jane Addams Award for The Little Fishes. Children can learn more at: Erik Christian Haugaard. Marguerite Henry (born Milwaukee, Wisconsin, 1902; died San Diego, California, November 26, 1997) wrote 59 books for children and young adults. She received two Newbery Honor Awards, one in 1945 for Justin Morgan Had a Horse and one in 1948 for Misty of Chincoteague. She earned the Newbery Medal in 1949 for King of the Wind. Children can learn more at: Marguerite Henry. Lee Bennett Hopkins (born Scranton, Pennsylvania, 1938) is a poet and novelist. His first career was as a teacher, and he found out how important poetry was to children and to him. He has published over 200 books, and one of his works is Good Rhymes, Good Times. Children can visit his website at: http://www.leebennetthopkins.com/. He also created the Lee Bennett Hopkins Poetry Award to honor the best poetry works of the previously published year. Children could visit the award’s site at: http://pabook.libraries.psu.edu/activities/hopkins/index.html. They could also read a biography of him and a history of the award in Children’s Book Award Handbook, by Diana F. Marks. Thomas Jefferson (born Albermarle County, Virginia, 1743; died Charlottesville, Virginia, July 4, 1826) was the third president (1801-1808) of the United States. He hoped people would remember him for writing the Declaration of Independence, for writing the statute of Virginia for religious freedom, and for founding the University of Virginia. He also made possible the Louisiana Purchase of 1803. 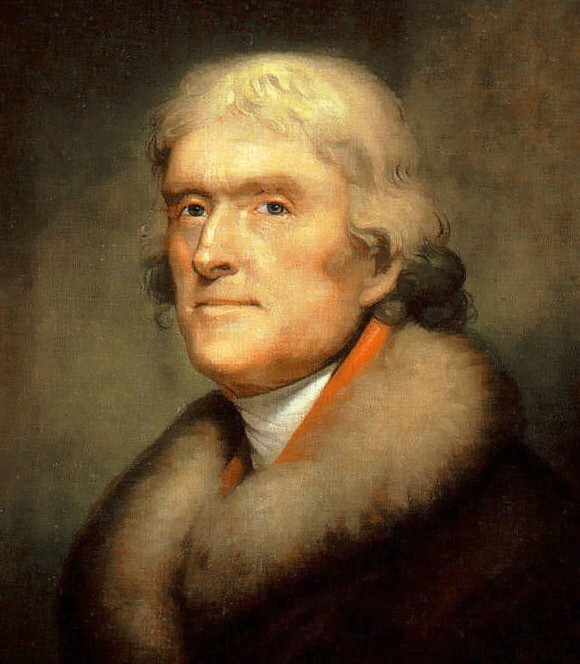 Children could visit a website at: Thomas Jefferson. Idea: Jefferson invented several items that made life easier, including the swivel chair, a lap desk, and a decoding device. Children could evaluate his inventions and draw diagrams of them. Rita Williams-Garcia (born Queens, New York, 1957) writes books for young adults. Her book One Crazy Summer won a 2011 Newbery Honor Award, the Coretta Scott King Medal, and the Scott O’Dell Award for Historical Fiction! Children can learn more at: http://www.ritawg.com/.